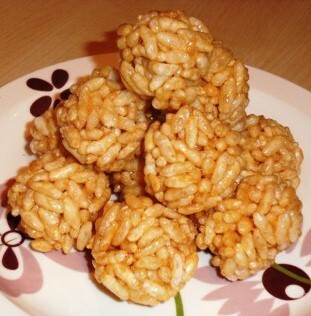 Puffed rice balls is a healthy snack to keep at home for when the hunger pangs strike. There is hardly any fat in the candy and the jaggery substitute for sugar makes it healthy too. Put a skillet on the gas so it is quite hot. Add the puffed rice and keep folding continuously till they are crisp and slightly browned. Remove from skilled and keep aside. Add the grated jaggery to the skilled and bring to a boil. Simmer till you achieve a two string consistency. Remove from gas. Immediately add the prepared puffed rice and mix till it is completely coated with jaggery. The mixture will cool fast as you mix. So shape 1 inch diameter balls with your hands. Let it cool and store in an air-tight box. Thinking what to serve for snack? Or just plain hungry and do not want to go to lenghts to prepare dinner? Or just weight conscious and nothing comes to mind that will be tasty yet light on calories? Then you have come to the right place. Churmura is all of this and more. It can be served to kids in paper cones that enhances its charm. The best part is you can keep adding to the quantity and taste by putting in whatever ingredients as you want. Mix all the ingredients together properly and serve. You can vary the ingredients as per your choice.